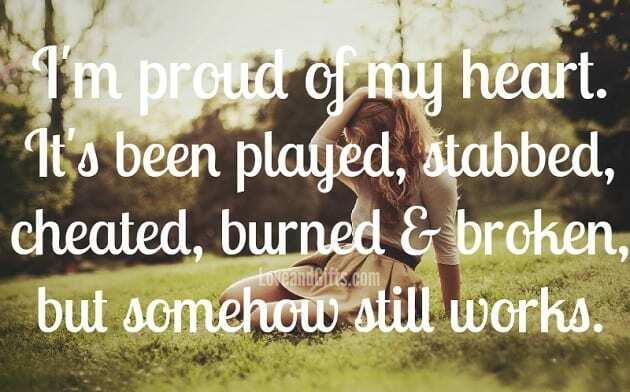 Be Proud of Your Heart! No matter what happens in your life, turn those hard times in to lessons and never let them break you down. The same thing goes for love and relationships. Despite aching for awhile, your heart will always keep beating which should inspire you to learn and move on as well. If you’ve had some bad luck in love and relationships, collect the things that you’ve learned from it so you will be better prepared to handle and nurture your future relationships. Be proud of your heart and love fearlessly no matter what! You don’t want to miss out on an opportunity of meeting someone who could be your perfect match while you’re dwelling on the past. Have you had some relationship experience that despite the heartache has helped you learn and grow as a person? Share with us if you will! We love to hear from you! Click here to see more of our love quotes!